There was a day when I didn’t care about cracks on top of a cheesecake. 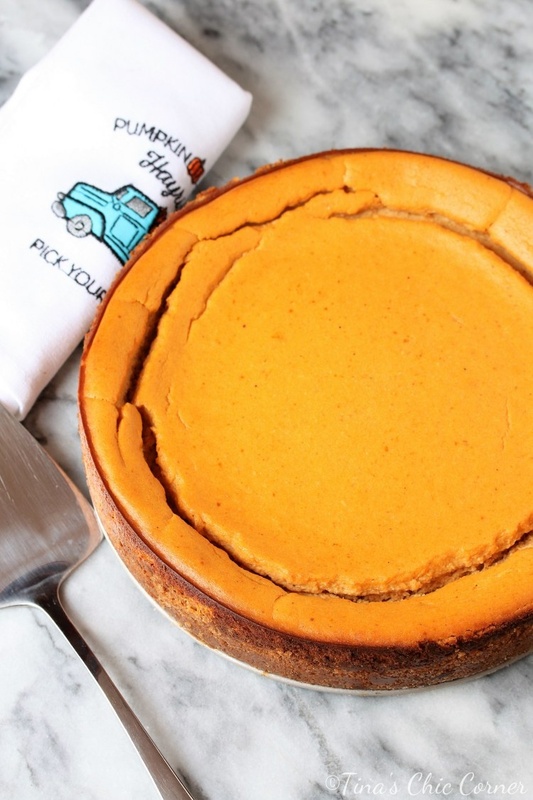 My husband has made this pumpkin cheesecake a few times (before my blogging days) and we’re pretty confident that it cracked then too and yet we continued to make it again and again. Why? It’s out of this world delicious. We loved it. Our families loved it. 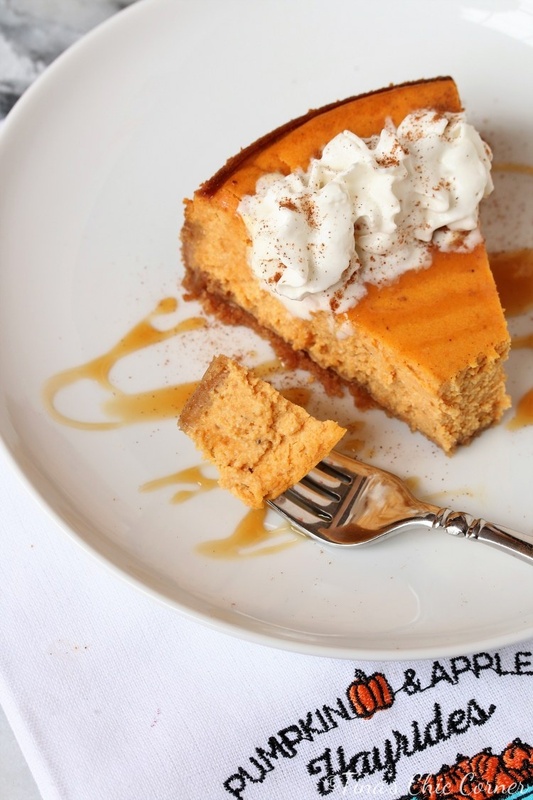 We’ve never made any other kind of pumpkin cheesecake because there is no need to try any other when you’ve found one that tastes as good as this one. Plus, it’s easy to make. I debated on whether to share this recipe with you today for the sole reason that it has the large, in your face, you can’t miss it, crater on top. Maybe I should work on the baking technique that prevents (or minimizes) the cracking before sharing the recipe with you. Is that a high standard that I put on myself? Maybe. Maybe not. I also think that we judge a book by its cover and the photo below is ugly. I’m embarrassed to show you photo since it doesn’t look “picture perfect”. I don’t know if you’re the kind of reader that will be turned off by seeing cracks in a cheesecake. I shared the below photo and the recipe with a friend before posting and she still wants to make it. Perhaps my indecisiveness is a result of me being overly critical on my photos. This cheesecake is destined to be on the Thanksgiving table tomorrow and needs to survive a 3 and 1/2 hour drive so whipped cream on top of the whole thing is not an option. If you don’t know, whipped cream deflates over time and gets yucky looking. I had to keep adding more to the slice in these shots because it kept hunkering down. Plus it was mad cloudy today which is very difficult to deal with when I only use natural light to take my pictures. 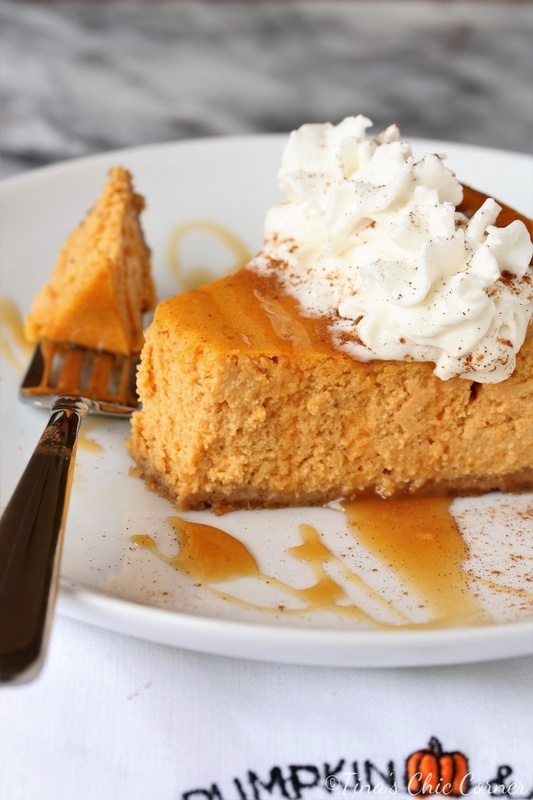 I think I deserve a freaking metal for putting up with all these obstacles with this pumpkin cheesecake today. Maybe I’m being a bit of a drama queen, but in the end anything this delicious is worth it. I ultimately decided to share this recipe today because my friends (including some of my fellow food blogger friends) and family encouraged me to share it. This is real life. Cheesecakes get cracks on top. If it’s tasty then share it. I thank you for your words of encouragement. Have a Happy Thanksgiving! I’m thankful for all my readers! In a food processor, blend the graham crackers until they are fine crumbs. Add the white sugar and drizzle in the melted butter. Blend until all of the ingredients are combined. Press the graham cracker crumb mixture into the bottom of the prepared pan and about 2/3 of the way up the sides. I used a 1/2 cup measuring cup to help pack the crumbs down firmly. Bake the crust in the preheated oven for 8 minutes. Allow the crust to cool. To make the filling, in a large bowl, beat the cream cheese and ricotta cheese until the mixture is smooth and creamy. (About 2 minutes on medium speed.) Make sure that the cream cheese is at room temperature. 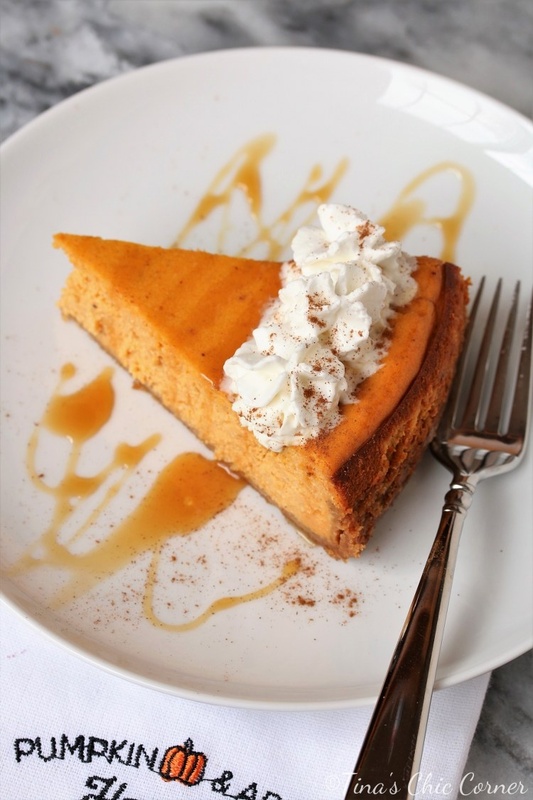 Add in the pumpkin puree and beat it well. Add in the light brown sugar, nutmeg, and vanilla extract, and beat well. Add in the eggs, one egg at a time and beat until blended after each one. Bake it for about 75 minutes in the preheated oven. When the cheesecake is done it will have a 2 to 3 inch wobbly area in the center of the cake. Don’t worry, it will set as it cools. Turn off the oven, open the oven door a little bit, and let the cheesecake sit in the oven for 1 hour. Take the cheesecake out of the oven and let it cool to room temperature on a wire rack on the counter. When you are ready to serve it, loosen the cheesecake from the rim of the pan and remove the outer rim. 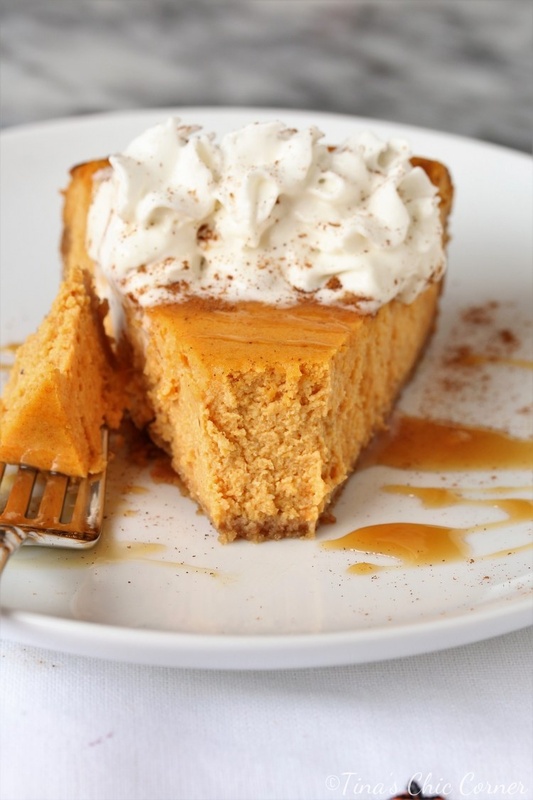 (Optional) Serve it with whipped cream and caramel sauce. Store leftover pieces in the fridge. Thanks for sharing the photo of the cheesecake as is for the recipe! I had no idea that it could lead to cracking but it still looks super tasty! I’m wondering back to whether the cheesecake my friend bought from Whole Foods had that too but was covered by whipped cream. Either way I’m looking forward to trying the Recipe with my hubby too sometime.